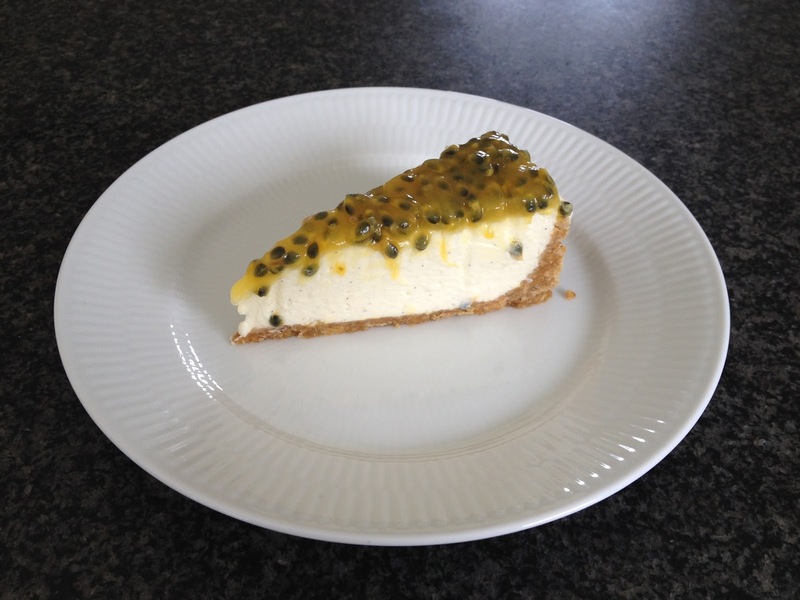 When I arrived in Sweden last week I found about 2 kg of ripe passion fruit in the fridge. 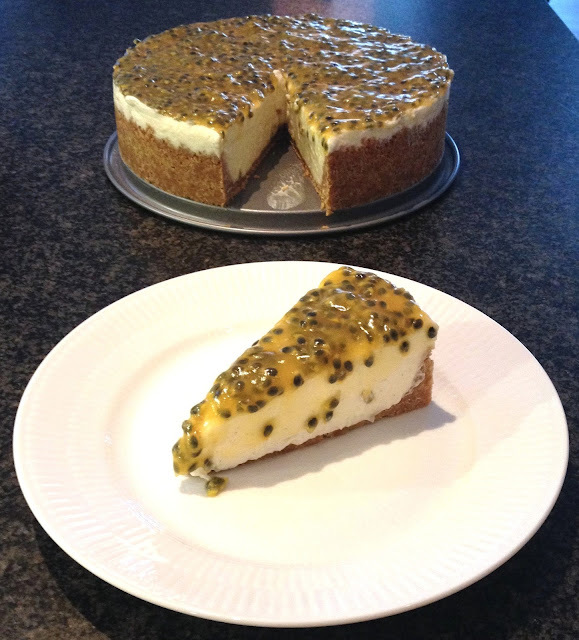 I remembered a nice cheesecake with passion fruit coulis that I had tasted a while ago. Since I had no eggs in the fridge I set to come up with a cheesecake recipe without eggs and that required no baking. I have already tested and posted the classic cheesecake recipe (which requires about 1 hr of baking) so this one is quite different in that it takes a lot less time to prepare and is a bit lighter and fluffier. In any case, try this no-bake cheesecake recipe, I really like it and makes for a nice dessert in Summer! Crush finely the digestive biscuits, add melted butter and mix a bit with a spoon. Grease a spring form and cover the base and sides of it with the biscuit mixture. Refrigerate for at least 10 min (leave it in the fridge until you need it). In a bowl whip cream cheese (it has to be at room T), sugar and seeds from a vanilla pod. In a small saucepan, heat up a bit the water and passion fruit juice. Add pre-wetted gelatin sheets and swirl until melted. Add melted gelatin to cream cheese mix while mixing. Finally fold in the whipped cream. Transfer the cream to the spring form and even out the surface. Cover and refrigerate for at least 3 hours (overnight is better). Place sugar and passion fruit pulp in a saucepan. Mix maizena and water in a bowl and add to the fruit. Heat up while stirring (don't stop) on medium heat and stir for about 3-4 min until thickened. Let the fruit cool down and then transfer on top of the cake. Refrigerate for another 2 hrs.